Norman Lewis Fearon was born on 25th January 1909[i] in Timaru the son of Sarah Jane (nee Kyle) and John Fearon. Norman was the youngest of thirteen children[ii], two of his older brothers served in World War One[iii]. Prior to World War Two Norman worked as a night porter holding positions in Carterton, Rotorua and Wellington. Wellington. [iv] On 26th August 1941 Norman Lewis Fearon was attested papers were signed. It notes that he was working for the Wellington Hospital Board and that his older brother William Fearon, Wellington is listed as his next of kin. On 11th March 1944 Private Fearon went before a medical board where his eye sights, blood pressure and psorasis resulted in him being medically regarded and discharged from the army. No information has been found on Norman’s life between his discharge from the army in 1944 and his death in Porirua Mental Hospital on 30th September 1968. 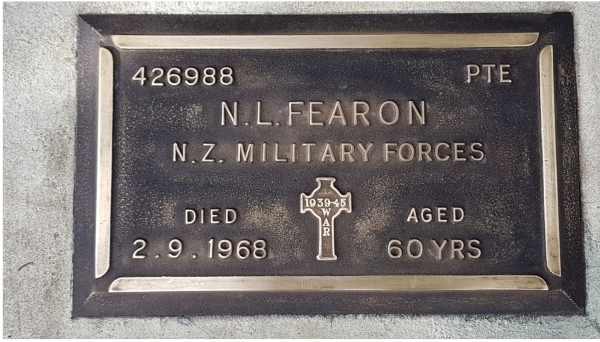 Norman Lewis Fearon is buried in the old Porirua Cemetery.